Network device discovery with Network Configuration Manager. Network device configuration management starts with creating an inventory. Since enterprises typically have hundreds of devices, doing this manually can be a pain, especially if the devices need to be listed based on their host name, series, model, etc. 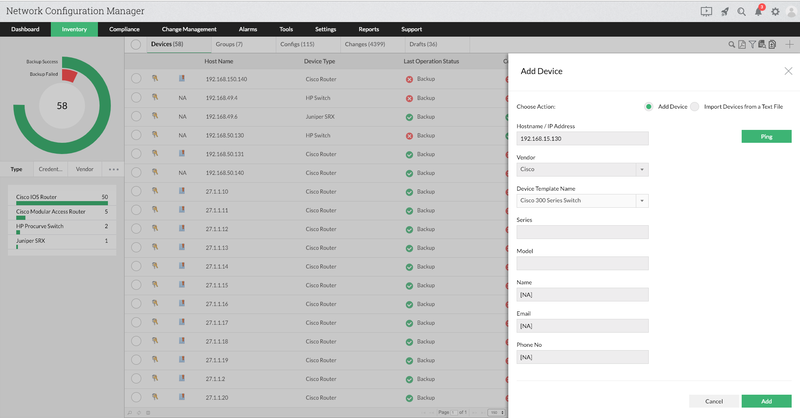 Network Configuration Manager’s network device discovery feature allows you to add SNMP-enabled devices in bulk in a single click. You can also add network devices manually or import them in bulk from a CSV file. Once the devices are discovered, they get listed in the inventory along with device details such as serial number, port details, IP address, and vendor. Network device discovery for SNMP-enabled devices. To discover SNMP-enabled devices, Network Configuration Manager sends a request via SSH, Telnet, or SNMP to all nearby devices. Upon receiving the request, the devices will send a SysObject ID (sysOID) to Network Configuration Manager’s discovery engine. The discovery engine will then try to match the ‌received sysOID with the default or custom sysOID. If a match is found, the device will be added and associated with the corresponding device template. If a match is not found, that particular device will not be added. Once communication is established, the configuration files are transferred to Network Configuration Manager using TFTP. To discover an individual device, provide the IP address or host name of that particular device. To discover multiple devices, either provide the start IP and end IP of an IP range, or import a CSV file. Once the credentials are provided during snmp device addition, the Discovery Reports tab opens automatically. In this section, you will be able to see the list of all the discoveries done till now sorted in descending order starting from recent. You can also view the status of every IP address, which is being discovered by clicking on the IP addresses. Also, when a particular device is not added by snmp addition method due to failure while discovering, but you are sure of it's authenticity, you can directly add it to the Inventory from this section. Network device discovery using manual addition. To add devices which are not SNMP enabled, you can use the manual addition method and discover network devices to the inventory. You need to provide the Hostname / IP Address, vendor name, device template name and other details to add the device. Once the details are given, that particular network device will be discovered and added in the inventory. Bulk network device import from a text or CSV file. Using this format, you can automatically discover any number of devices, thereby saving time and energy. Avoid these common mistakes during network device discovery. reachable but does not respond to the SNMP request. SNMP community is correct, but still the device does not get added. Once the devices are discovered, they get added to the inventory. 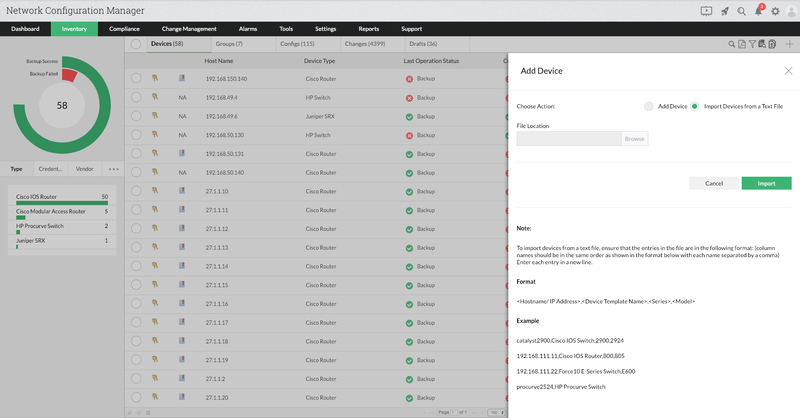 In addition to listing the discovered devices as well as their hardware properties, the inventory also helps you view, label, edit, and upload device configurations from a centralized web GUI. The inventory is a powerful tool because it gives you vital information on all the managed devices. Learn more!